As a marketing professional, you work with a dozen different tools every day: social media, content sharing, marketing automation, you name it. Switching between all of them might seem like a daunting task, right? Here at Wave video app, we feel for you and every fellow marketer out there and want to make your life a little easier. That is why we are happy to introduce new shiny integrations with your favorite platforms. You already know what a powerful marketing tool video can be when done right. So much so that by 2019, 80% of web traffic will be comprised of video, some marketers predict. If you haven’t already started using video as a part of your social media strategy, it’s just about time. Because we just made it a lot easier for you to create and share marketing videos. Do you post videos across several social media channels? Now you can do it without ever leaving the video maker. Our new integrations allow you to create and post your videos directly to Twitter, Facebook, YouTube, Vimeo and more. Once you are ready to share your video with the world, head over to the “Publish” section. Here, you will see an option to share your video or download it directly to your computer. We’ll go with the first one – Share. 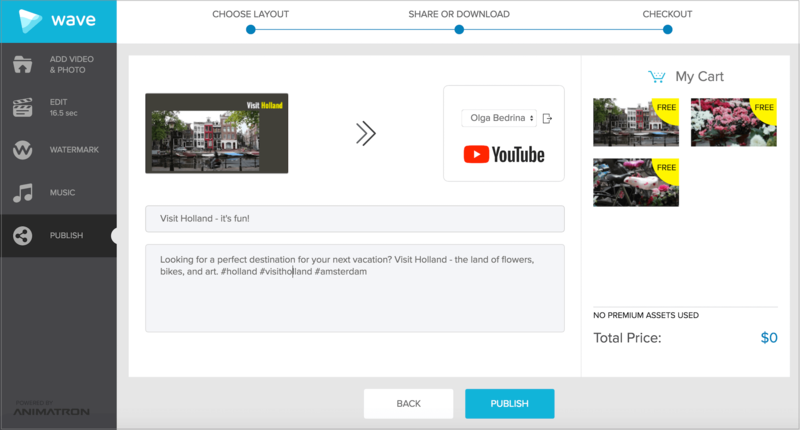 Choose a social platform, connect your account, add a title and description and hit publish – it’s that simple. Bonus tip: to get more likes and engagement on your video, try searching for some relative hashtags in advance. Tools like Keyword.io might give you some great insights into what your viewers might be searching for. If you are looking for some advice from Google, here’s an official article on how to use hashtags on YouTube. Here at Animatron, our team is spread out all over the world. With offices located in several countries, we rely on tools like Dropbox to share our creatives with each other. Uh oh, and Google Drive is our all-time favorite! Now, we can post videos that we create in Wave video app directly to Dropbox or Google Drive. Just like with the social platforms, simply select the platform of your choice and connect the two accounts. Enter a title and description (if applicable). If you’d like to upload your video to Dropbox, Wave will create a separate folder named “Wave” in your Dropbox. All videos that you create using Wave video app, will be uploaded directly to this folder. You can then just share the folder by creating a unique link to it. When uploading to Google Drive, you will get a unique link that will open your video. You can also organize your video, e.g., place it in a specific folder, download it from Google Drive, or even embed it to your website. Wistia and HubSpot are two marketing instruments that really take video marketing to the next level. The first one – Wistia – is a video hosting platform but it is actually much more than that. As they put it themselves, the Wistia team is on a mission to making business more human through video. And we are thrilled to be are part of this quest now, too. And, when you post videos to Wistia directly from within the Wave video app, you get to choose what projects the video should be uploaded to. It will help you stay organized with all the awesome videos that you create. With Wave HubSpot integration you can upload your videos directly to the File Manager in HubSpot and use them for creating landing pages, emails or any other inbound marketing materials that you need. The Wave team is coming to INBOUND 2017! Stop by our booth S11 to ask us about the HubSpot-Wave integration, talk about all things video marketing or just say hi. We will be rolling out more awesome features, later on, to help you succeed with your video marketing efforts. Stay tuned!